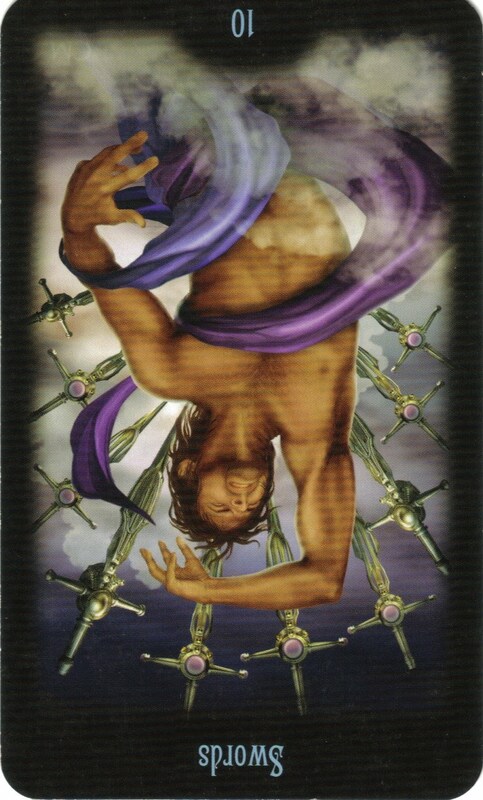 Today’s card -- the Ten of Swords Reversed -- comes from the Legacy of the Divine Tarot by Ciro Marchetti. The Ten of Swords (reversed) indicates that the worst is over and you are ending one cycle to begin another. Thank Goodness! Whenever I pull the Ten of Swords (especially in the upright position), I know that things have been tough. The reversed position brings some relief because the pain is behind you and now you can move forward. In Marchetti's book, "Gateway to the Divine Tarot ," he gives keywords for this card including, "Overthrow of evil forces, time to rebuild, recovery, inner strength." If you'd like more information on the Ten of Swords (reversed), click here. Because I pulled this card recently, I wanted to pull an additional card from the Messages of Life deck by Mario Duguay. These cards are so beautiful and have deep, meaningful messages accompanying the artwork.You can click here to check it out or go to your local (metaphysical) bookstore. Today's card is Strength...a perfect card to go with the energy of the Ten of Swords -- either upright or reversed. "I do not let my emotions control me; I keep my thoughts pure and do not yield my power to anyone or anything. I rise above self doubt. I gain confidence in myself through my own power and my unshakable faith that I ahve the strength to overcome anything. I find courage in truth, and to overcome my fears, I resort to the most powerful weapon: love." Reading this card reminded me of my yoga practice this morning. As we were holding a challenging pose for what seemed like forever :), the teacher said, "When you think you need to come out of the pose is when true growth begins." Just when I wanted to give up, I called on my inner strength and found a way to breathe through my thoughts of giving up; I pulled out my most powerful weapon (love), and gracefully flowed into the next pose. If you have or are facing a Ten of Swords situation (feeling as though you have been stabbed in the back, defeated, pain, etc. ), the message today is to call on your inner strength, love...and move forward. Remember that growth begins the second you move through what you thought was impossible. Use the affirmation on today's card to help you find your strength...grow forward...and leave the Ten of Swords energy behind. *crying* I think I'm going to bookmark this post and refer to it often when I have been feeling particularly defeated and need a boost. Thank you, Sheri. With my brother's passing last week, my mother's increased dementia, and the closing up of our family home, I felt the "frame" of what we had always known had crumbled ~ including my identity role along with it. Today's card was powerfully significant. Thank you! This hit home for me today. We have been going through a tough time with our business and having to move out of our rental home (due to water damage). We are still looking for a new place to live. I had been feeling pretty defeated the past few days and woke up this morning with a new perspective. Really feeling the ten of swords (reversed) energy. "things have been tough.. brings some relief because the pain is behind you and you can move forward". I'm really "feeling" this way even though I don't see clearly how it's going to take place. How awesome to connect these two cards with one of the most helpful yoga sayings. "I find courage in truth, and to overcome my fears, I resort to the most powerful weapon: love." I will remember this the next time I feel frustration with a loved one. Love is a much better weapon, isn't it? Wow. This is truly amazing for me to read this week. My ex is getting remarried tomorrow. A good friend told me that she believes I will feel like a burden has been lifted once I get through tomorrow. This definitely feels like a new time in my life. I have been focusing on learning new ways of dealing with my stress and emotions. Some other things have come up this week (sister with mental illness having an "episode") and so many feelings from the past have been coming up--I have felt like that scared little girl inside who wasn't protected by my parents. I can read this card as the worst from my marriage and divorce recovery is behind me, but also that the worst with the old wounds from growing up is also behind me. The pain I've been feeling the last few days is old pain--not due to any present circumstances. On your previous post you wrote: "Sit quietly today and reflect on where and how you may have experienced the Ten of Swords (feeling as though you've been stabbed in the back) recently. Release yourself of the burden of carrying these hurts further by letting go of the blame and resentments about what happened." I am working on letting go of blame and resentments in both of those situations, and working on knowing that the only one I can control is myself. This was exactly what I needed to read today. Thank you. This is a very encouraging set of cards - a reminder of how the conditions that required strength are an opportunity to experience the gift of it. The experiences of ebb and flow are constants. When I allow my inner strength to support me through the ebbs of life, (versus struggle against it whatever is in the moment) I am supporting my faith that the flow is there too… Thanks Sheri! I hope this is true. I definitely feel like I have been through the worst. I'm hoping that I can move forward now, for what, I'm not quite sure yet. I definitely felt that what I've been through sure did seem impossible. I'm still sad about it all, but I have happiness now too. Thanks for the interpretation of this card. Can You Help with this Lost Child?